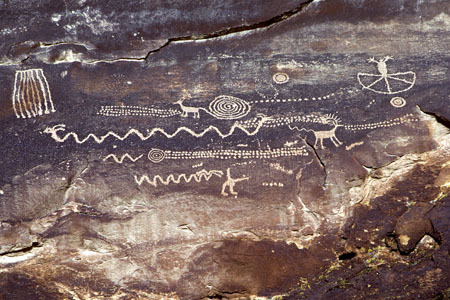 A concentration of some of the best Fremont rock art, along with older and more recent styles, is located in Nine Mile Canyon. 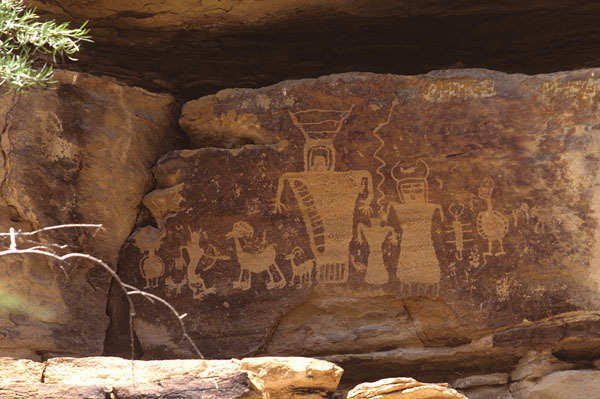 The lush, wide, irrigable bottom lands in Nine Mile Canyon are lined with cliff faces bearing numerous petroglyphs and pictographs. 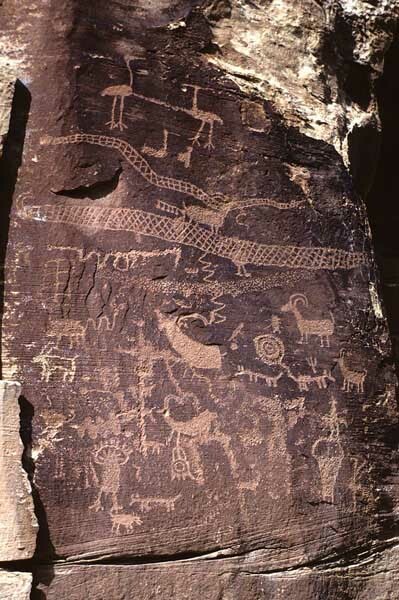 Portions of Nine Mile Canyon with rock art have long been accessible to the public. Roadways reach even side canyon panels, and many panels are on the cliffs adjacent to a major road segment between the Price/Green River and Vernal areas. As a consequence, some panels have been damaged during modern times. If you visit, be careful: the largest rattlesnake I've seen in the wild was right below a nice panel right above the road in the main canyon. 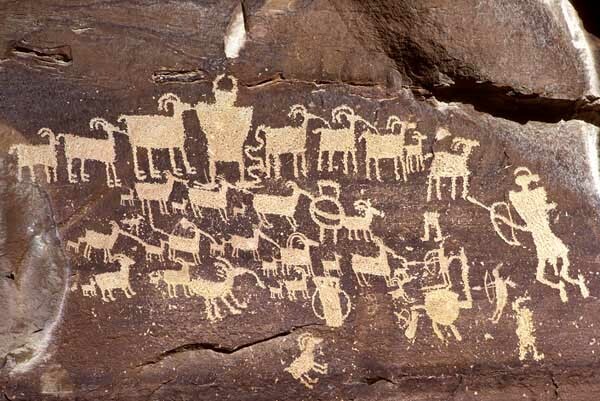 predate Fremont culture as recognized in Utah from about AD 500. 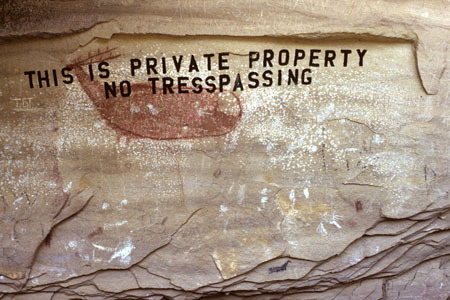 Note the error spelling trespassing. 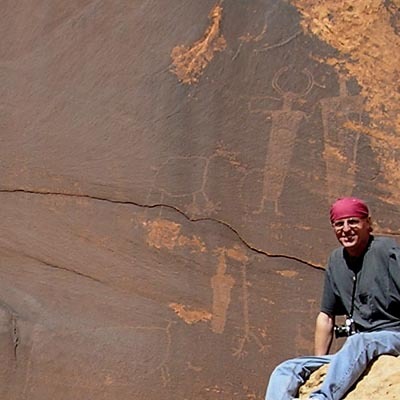 Fremont culture is named 'Fremont' due to expression of the culture along the Fremont River, particularly evident in the section where the river transects the sandstone cliffs of Capitol Reef National Park. The Fremont River sites are also impacted by historic access, especially gunfire damage. 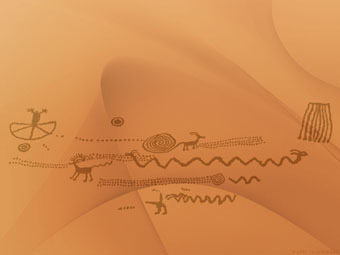 Petroglyphs there display the characteristic Fremont adornments. Most of Eastern Utah is Fremont area. Only the southeastern portion is Puebloan. Puebloan sites reach as far north as Canyonlands, south of the mouth of the Green River. 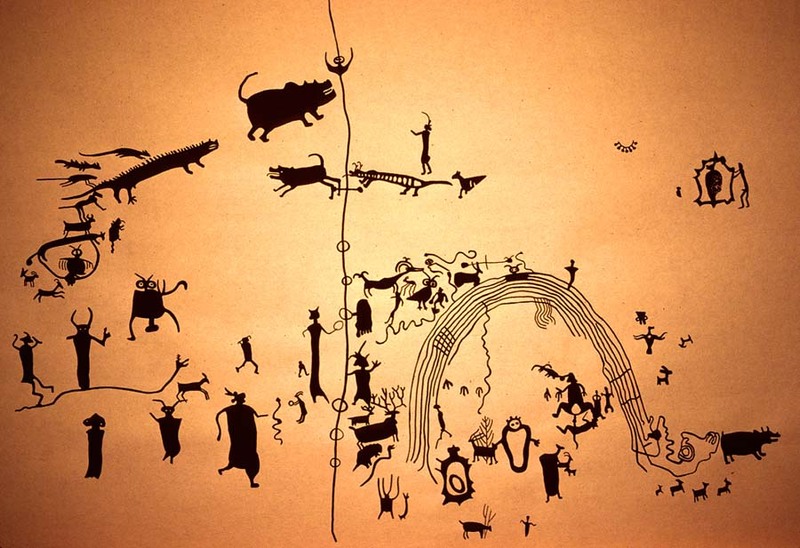 The panels illustrated in this page are from the Fremont culture area. 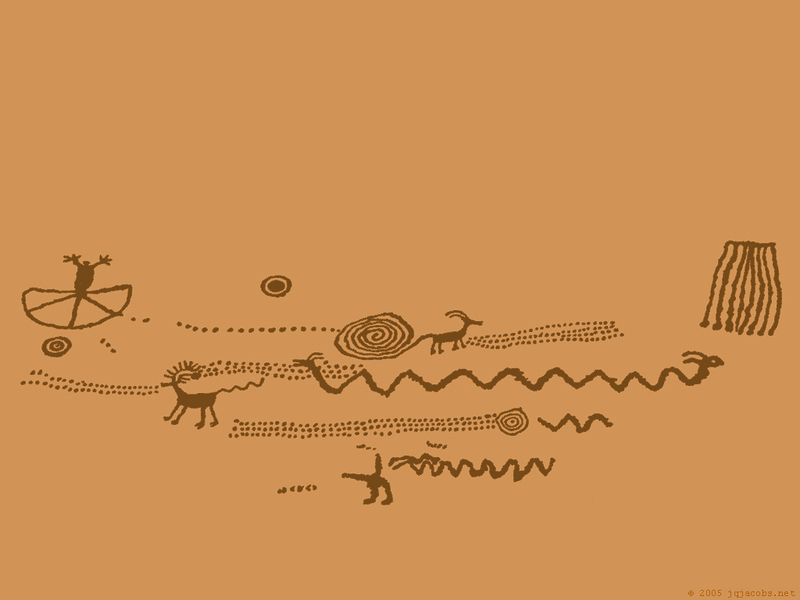 Dating rock art is difficult at best, so "area" is a better reference than culture. Not all glyphs on this page are from the narrow temporal span defined as Fremont culture (AD 500 to 1300), all are from the geographic area occupied by that culture. The area with earlier Barrier Canyon Style art is within the more extensive Fremont culture area. 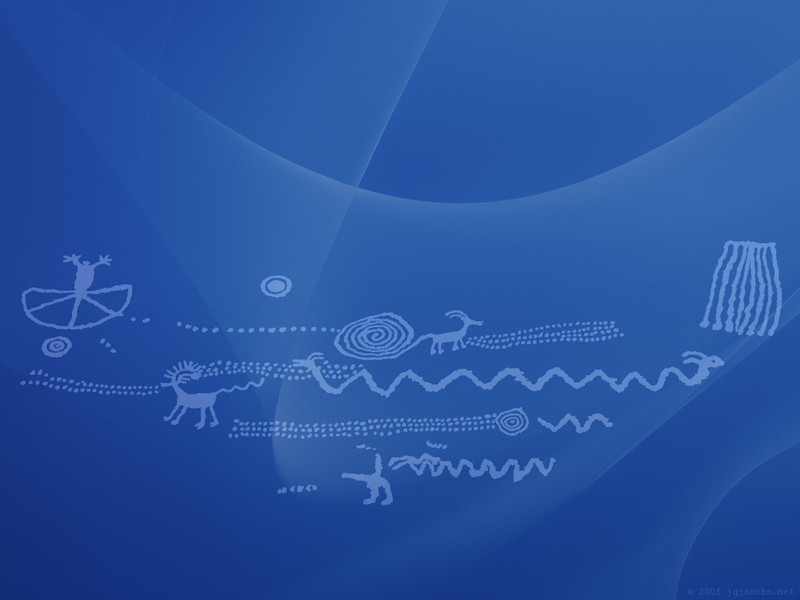 The recent petroglyphs of horses with riders are much brighter than old prehistoric glyphs. removing the dark mineral patina accreted on the surface reveals the light rock interior. Over time, the process of patination very slowly restores the darker rock surface color. 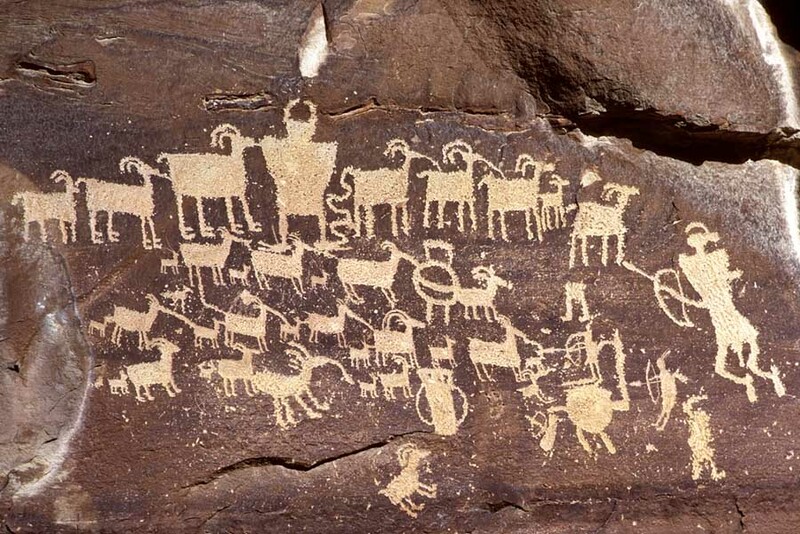 This Fremont family was apparently petroglyphed in a single cultural episode. Notice the color difference of the one glyph on the left above, an indication of later etching. 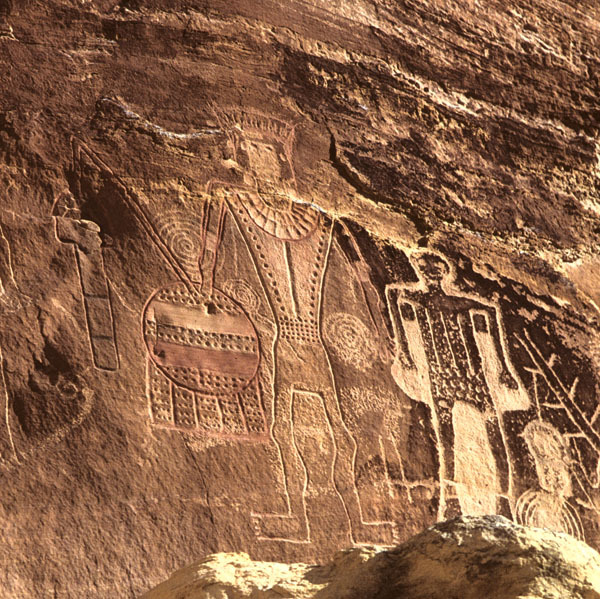 Several beautiful rock art panels were carved in the Nine Mile Canyon system side canyons. including at nearby Buckhorn Wash, in the northern San Rafael Swell. Several rock facets in the Nine Mile Canyon system have fields with numerous dots. Cottonwood Canyon dot group panel. Download a 1024 x 768 pixel desk picture of an ink rendition. Tan or Blue. 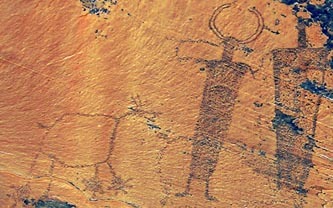 The Hunting Scene. The tall, rocky cliffs lining the canyon provide extensive game habitat. One of the most unusual petroglyph panels in Eastern Utah is the Rochester Creek Panel. species is found in the abundance of fossils in the region, including a nearby dinosaur quarry. Rochester Creek is located west of the San Rafael Swell and Buckhorn Wash.
and photo-realistically rendered on 30 x 22 inch watercolor paper. Rochester Creek - 1 MB print-ready file. Print a black image at 600 dpi on 8.5 x 11 paper. of human culture. 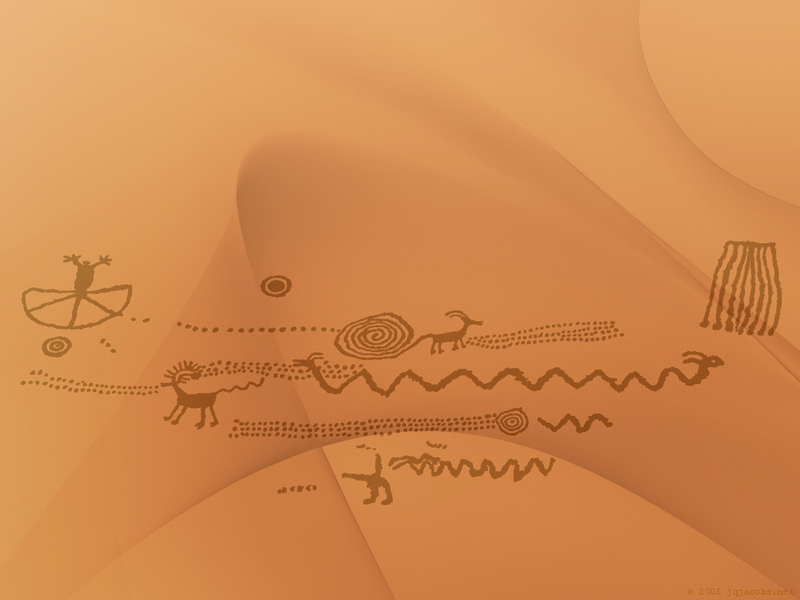 Excellent examples of Archaic Style glyphs are found in the area. Note the two faint, large zoomorphs in the left half of the image above. Below, the Photoshop inverted image reveals the otherwise faint details of one. Style of zoomorphs varies considerably over time. Click image for larger file. At Newspaper Rock mounted horse glyphs are a useful indicator of petroglyph ages. Newspaper Rock - 1 MB print-ready file. Print a black image at 600 dpi on 8.5 x 11 paper. Click on the images above to download 1024 x 768 pixel desk pictures. 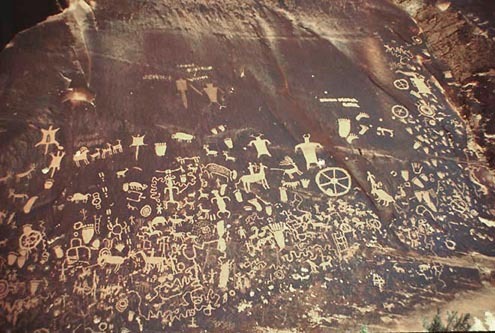 Fremont Indian State Park, located southwest of Richfield off Interstate 70 in central Utah, has 697 rock art panels, a museum housing Utah's largest Fremont site excavation artifact collection, a campground, and 14 trails between ¼ mile and five miles in length. Summer -- 9 a.m. to 6 p.m.
Winter -- 9 a.m. to 5 p.m.
All rights reserved. Copyrighted 2005 by James Q. Jacobs. This page is being added in 2005, eight years after the original Rock Art Pages were created. Release of information on Range Creek, Eastern Utah, produced global interest in Fremont archaeology. 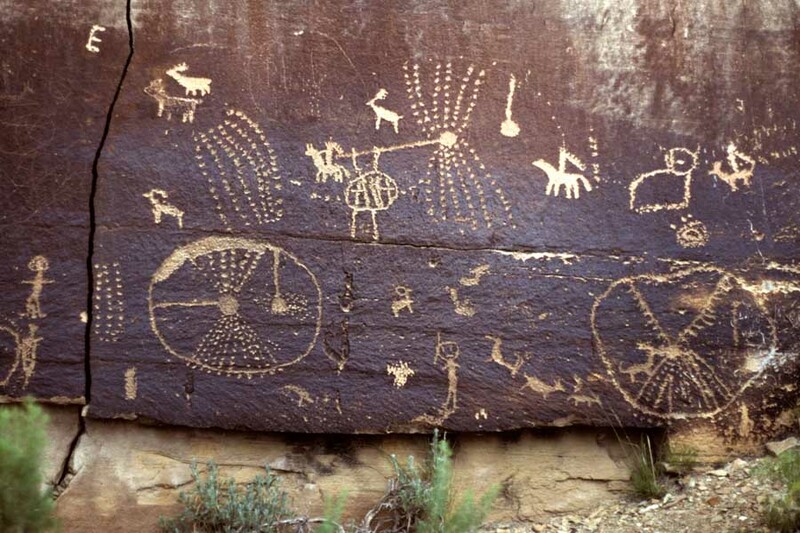 As a result, I recently scanned several submissionsa group of Fremont rock art slideswith my new equipment. 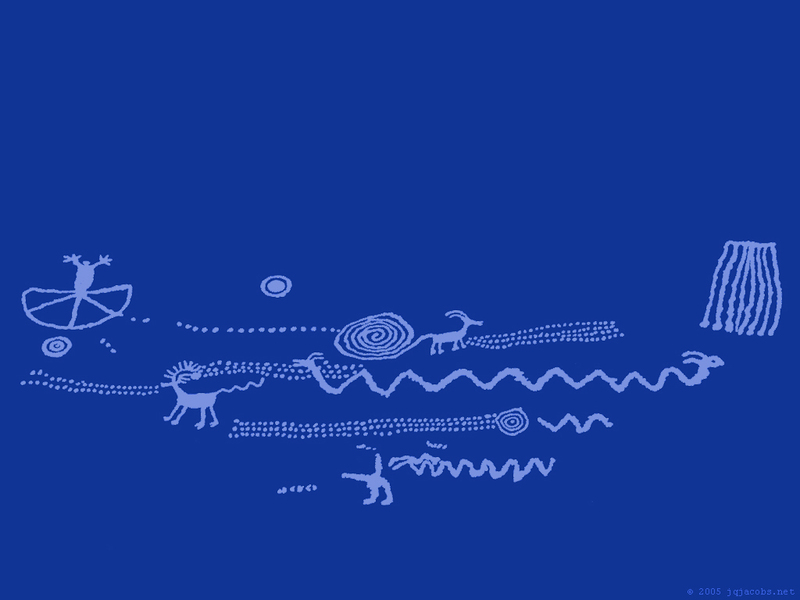 (The Three Kings Panel Sun Carrier detail, fills a page in Abenteuer Archaologie, 2/2005.) The submission requests provided the opportunity to scan or rescan a selection of Fremont culture area panels, the images herein and several images added to the two previous Northeast Utah pages. 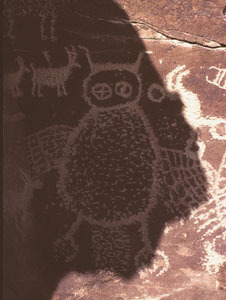 The rock art images above are from areas near Range Creek, especially so those in Nine Mile Canyon, a drainage on the opposite side of the Green River. Range Creek is a tributary stream situated east of the Green River, down river from the Yampa confluence and Dinosaur National Monument in the Uinta Basin, south of Vernal and the Classic Vernal Style area.